From the Graduate Institute of Clinical Medical Science (Wang, Chen, Huang); the Department of Internal Medicine (Wang, Liang, Chang C.-T., Lin); the Division of Kidney Disease (Wang); the Management Office for Health Data (Muo, Chen, Sung), China Medical University Hospital, Taichung, Taiwan; the Department of Public Health (Muo, Sung); the Department of Medical Laboratory Science and Biotechnology (Chang Y.-C.), China Medical University, Taichung, Taiwan; the Division of Nephrology (Yen), Chang Gung Memorial Hospital-Taipei Medical Center, Chang Gung University College of Medicine, Taoyuan, Taiwan; the Division of Nephrology (Chuang), Chang Gung Memorial Hospital-Kaohsiung Medical Center, Chang Gung University College of Medicine, Kaohsiung, Taiwan; the Institute of Population Science (Wen), National Health Research Institute, Zhuan, Taiwan; and the UCLA Fielding School of Public Health (Morisky), Los Angeles, Calif.
Background: Studies into the association between hypertensive disorders during pregnancy and end-stage renal disease are limited. We investigated the risk of end-stage renal disease after delivery among women with hypertensive disorders during pregnancy. Methods: We used insurance claims data from 1998 to 2009 to identify 26 651 women aged 19–40 years old who experienced hypertensive disorders during pregnancy; these women had no history of hypertension, diabetes, kidney disease or lupus. We also randomly selected 213 397 women without hypertensive disorders during pregnancy as a comparison cohort; the frequency was matched by age and index year of pregnancy. We compared the incidence of end-stage renal disease in the 2 cohorts. We calculated hazard ratios (HRs) and 95% confidence intervals (CIs) after controlling for demographic and clinical factors. Results: Women with hypertensive disorders during pregnancy had a greater risk of chronic kidney disease and end-stage renal disease, with adjusted HRs of 9.38 (95% CI 7.09–12.4) and 12.4 (95% CI 8.54–18.0), respectively, after controlling for urban status, coronary artery disease, congestive heart failure, hyperlipidemia and abruption. The HR for end-stage renal disease was 2.72 (95% CI 1.76–4.22) after we also controlled for hypertension and diabetes. Women with preeclampsia or eclampsia had a higher risk of end-stage renal disease (adjusted HR 14.0, 95% CI 9.43–20.7) than women who had gestational hypertension only (adjusted HR 9.03, 95% CI 5.20–15.7). Interpretation: Women with hypertensive disorders during pregnancy were at a high risk of end-stage renal disease. The risk was much greater for women who had preeclampsia or eclampsia than those who had gestational hypertension only. Hypertensive disorders during pregnancy affect the function and morphology of the kidney.16 Previous studies have reported an increased prevalence of microalbuminuria after pregnancy in women who had a hypertensive disorder during pregnancy.17,18 In a case–control study, there was an association between biopsy-proven renal disease and a history of preeclampsia.19 However, studies about whether hypertensive disorders during pregnancy are associated with end-stage renal disease in later life are limited.20 Only 1 study, performed using birth and renal registries from Norway, has reported that women with preeclampsia during their first pregnancy had a 3.2-fold higher risk of end-stage renal disease.20 In the present study, we investigated the risk of end-stage renal disease among Taiwanese women who had a hypertensive disorder during pregnancy. We obtained a data set consisting of health care reimbursement claims for the 1996–2009 period from the National Health Research Institutes for Taiwan’s National Health Insurance Program. The Taiwan National Health Insurance Program had a coverage rate of 93.1% for the 23 million residents in 1996; the coverage rate was 99% in 2009. Patient identification numbers that were used for linking files were scrambled before the dataset was released to ensure patient privacy. This study was approved by the research ethics committee of China Medical University Hospital. We identified 28 724 women with hypertensive disorders in pregnancy (International Classification of Disease 9th revision, clinical modification [ICD-9-CM] codes 642.3, 642.4–642.6, 642.9) in their first pregnancy during the study period and who were 19–40 years of age between 1998 and 2009. This was defined as the index pregnancy. The date on which a hypertensive disorder was diagnosed was used as the index date for estimating follow-up time. We excluded women who had a history of hypertension (n = 447), diabetes (n = 1194), renal disease (n = 396) and systemic lupus erythematous (n = 36) before the index date. We included the remaining 26 651 women who had a hypertensive disorder during pregnancy as the study cohort. For each woman with a hypertensive disorder during pregnancy, we randomly selected 8 women without hypertensive disorder during pregnancy (comparison cohort, n = 229 792); these women had a normal first pregnancy and were frequency matched by age and index year. In addition to the exclusion criteria used to select the cohort of pregnant women, we also excluded from the comparison cohort women who had a hypertensive disorder during pregnancy before the development of end-stage renal disease or who were ineligible by the end of 2009 (n = 16 395). All participants were followed until Dec. 31, 2009, to identify incident chronic kidney disease (ICD-9 code 582, 585, 587, 403 and 404) and end-stage renal disease. In Taiwan’s insurance system, patients with end-stage renal disease are registered in the Catastrophc Illness Patients Database using ICD codes similar to those for chronic kiddney disease (ICD-9 codes 582, 585, 587, 403 and 404). Data for participants who died or withdrew from the National Health Insurance Program were censored. Patients with end-stage renal disease were identified from the Catastrophic Illness Patients Database, which includes those who require long-term renal replacement therapy, such as dialysis or kidney transplant. We recorded demographic data including age at index pregnancy (19–24, 25–29, 30–34 and 35–40 yr) and urban status level. Baseline disorders, including coronary artery disease, congestive heart failure and hyperlipidemia were identified before the index date. Postpartum coronary artery disease, congestive heart failure, hypertension, hyperlipidemia and diabetes were also identified before the outcome or Dec. 31, 2009. Preterm delivery and abruption were identified during the index pregnancy. These disorders were considered to be comorbidities that were potentially associated with the development of end-stage renal disease. The National Health Research Institutes has divided Taiwan into 7 levels based on urban status (level 1 = highest urban areas; level 7 = lowest urban areas). We grouped levels 6 and 7 with level 5 because of the low population in those areas. We classified the subtypes of hypertensive disorders during pregnancy as gestational hypertension only and preeclampsia. We compared the demographic data and comorbidities between cohorts with and without hypertensive disorders. We used the χ2 test for categorical variables and t test for continuous variables. We calculated the incidence of end-stage renal disease in both cohorts. We used Cox proportional hazards regression analysis to estimate the hazard ratios (HRs) and 95% confidence intervals (CIs) of chronic kidney disease and end-stage renal disease for the cohort with hypertensive disorders during pregnancy relative to the cohort without these disorders. We examined the Cox proportional hazards assumption using the likelihood test. The assumption was not violated (p = 0.2). We used 4 models to estimate crude HRs and adjusted HRs for evaluating the risk of end-stage renal disease. We used univariate analysis for model 1. Model 2 controlled for urban status, coronary artery disease, congestive heart failure, hyperlipidemia and abruption. In addition to these factors, we also adjusted for hypertension and diabetes in model 3. Model 4 was a time-dependent Cox proportional hazards regression model with hypertension and diabetes as time-dependent variables; this model was also adjusted for variables included in model 3. We also examined how postpartum hypertension and diabetes altered the risk of chronic kidney disease and end-stage renal disease. We used Kaplan–Meier analysis to assess the proportion of participants without end-stage renal disease in each cohort. 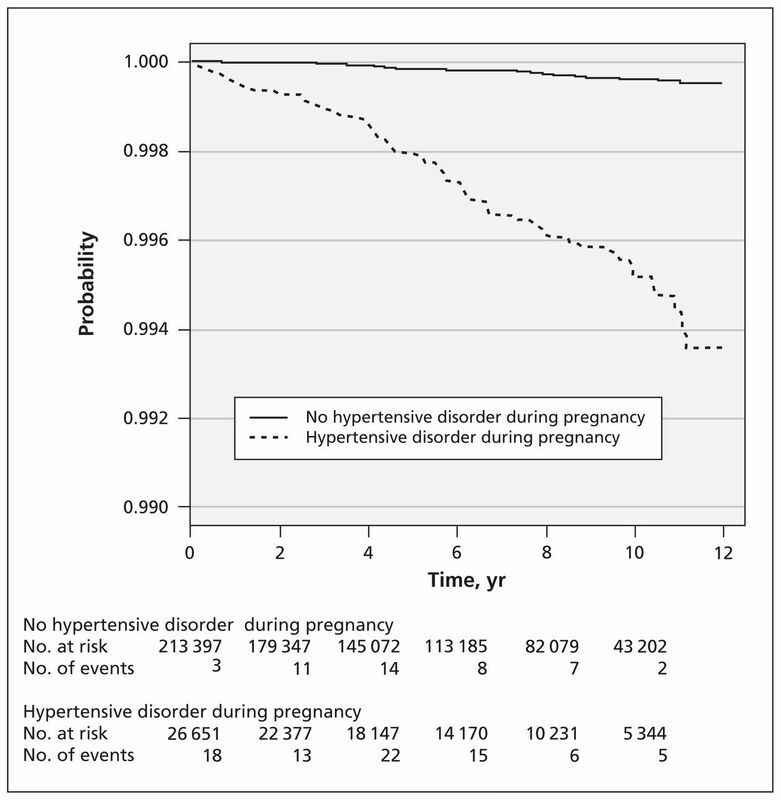 Compared with the cohort without hypertensive disorders during pregnancy (n = 213 397), those with hypertensive disorders during pregnancy (n = 26 651) had fewer urban residents but had higher rates of congestive heart failure and hyperlipidemia before the index date and more comorbidities after the index date (Table 1). The crude HR for chronic kidney disease was 10.8 (95% CI 8.2–14.2); the adjusted HR was 9.38 (95% CI 7.09–12.4) (Table 2). Among women without hypertension during follow-up, women who had experienced hypertensive disorders during pregnancy had a higher risk of chronic kidney disease (adjusted HR 4.37, 95% CI 2.71–7.07). The incidence of end-stage renal disease was 14.1-fold higher among women who had hypertensive disorders during pregnancy than among those without (crude HR 14.1, 95% CI 9.76–10.30) (Table 3). The HR decreased slightly after we controlled for urban status, coronary disease, congestive heart failure, hyperlipidemia and abruption (model 2), and decreased further after we adjusted for hypertension and diabetes (model 3). In the time-dependent (model 4), the adjusted HR was 1.91 (95% CI 1.20–3.07). With a mean follow-up time of about 6.3 years for both cohorts, our Kaplan–Meier analysis showed that the overall proportion of participants without end-stage renal disease was lower for the cohort with hypertensive disorders during pregnancy compared with the cohort without such conditions (Figure 1). Estimated proportion of women without end-stage renal disease among those with and without hypertensive disorders during pregnancy. Log-rank test, p < 0.001. Women with preeclampsia or eclampsia were at higher risk of end-stage renal disease than those who had only gestational hypertension (Table 3). To reduce the immediate effect of pregnancy complications on the risk of adverse outcomes, we performed an additional analysis that excluded events in the first year after delivery. The HRs for end-stage renal disease were 12.7 (95% CI 8.65–18.6), 11.2 (95% CI 7.56–16.5), 2.11 (95% CI 1.34–3.30) and 1.44 (95% CI 0.90–2.32) for models 1 to 4, respectively. The interaction between preterm delivery and hypertensive disorders in pregnancy was not significant (p = 0.8). The incidence of end-stage renal disease was greater for women with postpartum hypertension than for those with postpartum diabetes (Table 4). Among women without postpartum hypertension or diabetes, women with hypertensive disorders during pregnancy had higher HRs for end-stage renal disease than women without hypertensive disorders in pregnancy. We found an increased risk of subsequent end-stage renal disease among Taiwanese women who had experienced a hypertensive disorder during pregnancy, including preeclampsia or eclampsia and gestational hypertension. We also found that women with preeclampsia or eclampsia were at higher risk of end-stage renal disease than those who had gestational hypertension only. Women with preeclampsia also have a higher risk of end-stage renal disease than women with gestational hypertension only. Using consistent definitions of end-stage renal disease as Vikse and colleagues,20 we found that women with hypertensive disorders during pregnancy had a nearly 14-fold higher incidence of end-stage renal disease than women without hypertensive disorders during pregnancy; women with pre-existing hypertension, diabetes, renal disease or lupus were excluded from our analysis. The adjusted HR was considerably lower after we adjusted for hypertension and diabetes, indicating that these 2 factors account for a large portion of the risk attributed to hypertensive disorders during pregnancy and that these may be intermediate steps in the development of end-stage renal disease. We found no statistically significant interaction between hypertensive disorders during pregnancy and preterm delivery. We also found that women with only gestational hypertension had a 10-fold higher incidence of end-stage renal disease than women without hypertensive disorders during pregnancy (3.40 v. 0.34 per 10 000 person-years). Diabetes and hypertension are also major risk factors for chronic kidney diseases.29 During the follow-up period, women may develop postpartum hypertension and postpartum diabetes. Among women with hypertension or diabetes in later life, those with hypertensive disorders during pregnancy had a much higher incidence of end-stage renal disease than those without. However, we found that the risk was much greater among women with postpartum diabetes than among those with postpartum hypertension (Table 4). Among women with postpartum hypertension, the adjusted risk of end-stage renal disease among women who had a hypertensive disorder during pregnancy was not significant after we controlled for covariates. Therefore, hypertension that develops after pregnancy may mediate the association between hypertensive disorders during pregnancy and end-stage renal disease. The follow-up period after pregnancy in our study was relatively short for the measure of lifetime end-stage renal disease and comorbidities. Whether pre-existing renal disease causes hypertensive disorders during pregnancy and is followed by the deterioration of renal function is unclear. Finally, we used the first pregnancy during the study period as the index pregnancy. This might have led to misclassification for a small number of women, whose second pregnancy may have been classified as the index pregnancy. We found that women with hypertensive disorders during pregnancy were at higher risk of end-stage renal disease than women without complicated pregnancies. Postpartum hypertension and diabetes further increased this risk. The risk of end-stage renal disease is likely higher in this Taiwanese population than in Western populations. Close surveillance for microalbuminuria, blood pressure and diabetes should be considered for women with a history of hypertensive disorders during pregnancy. Preventive strategies, such as pharmacologic or lifestyle interventions, should also be considered for women at high risk of end-stage renal disease. Further prospective studies are needed to investigate the relation between hypertensive disorders during pregnancy and subsequent end-stage renal disease. The authors thank the Taiwan National Health Research Institute for providing the National Health Insurance database. Funding: This study was supported by the National Sciences Council, Executive Yuan (grant nos. NSC 97–2625-M-039–003, NSC 100–2621-M-039–001); China Medical University Hospital (grant no. 1MS1); Department of Health, Taiwan, Clinical Trial and Research Center for Excellence (grant no. DOH101-TD-B-111–004); and Cancer Research Center of Excellence (grant no. DOH101-TD-C-111–005). Contributors: I-Kuan Wang, Yi-Chih Chang, Chiz-Tzung Chang, Chih-Chia Liang, Shih-Yi Lin, Tzung-Hai Yen, Feng-Rong Chuang, Chiu-Ching Huang, Chi-Pang Wen, Fung-Chang Sung and Donald E. Morisky designed the study. Chih-Hsin Muo and Pei-Chun Chen carried out the statistical analysis. I-Kuan Wang, Chih-Hsin Muo, Yi-Chih Chang, Chih-Chia Liang, Chiz-Tzung Chang, Shih-Yi Lin, Tzung-Hai Yen and Feng-Rong Chuang drafted the manuscript. Pei-Chun Chen, Chiu-Ching Huang, Chi-Pang Wen, Fung-Chang Sung and Donald E. Morisky revised the manuscript. All authors approved the final version submitted for publication.
. Pregnancy outcomes in healthy nulliparas who developed hypertension. Calcium for Preeclampsia Prevention Study Group. Obstet Gynecol 2000;95: 24–8.
. Population-based trends in pregnancy hypertension and pre-eclampsia: an international comparative study. BMJ Open 2011;1:e000101.
. Report of the Canadian Hypertension Society Consensus Conference: 1. Definitions, evaluation and classification of hypertensive disorders in pregnancy. CMAJ 1997;157:715–25.
. Predicting transformation from gestational hypertension to preeclampsia in clinical practice: a possible role for 24 hour ambulatory blood pressure monitoring. Hypertens Pregnancy 2007;26:77–87.
. Preeclampsia: a renal perspective. Kidney Int 2005;67:2101–13.
. Diabetes mellitus in the 21 years after a pregnancy that was complicated by hypertension: findings from a prospective cohort study. Am J Obstet Gynecol 2007;197:492.e1–7.
. Preeclampsia and risk of developing subsequent diabetes. Hypertens Pregnancy 2009;28:435–47.
. Long term mortality of mothers and fathers after pre-eclampsia: population based cohort study. BMJ 2001;323:1213–7.
. Pre-eclampsia and the later development of type 2 diabetes in mothers and their children: an intergenerational study from the Walker cohort. Diabetologia 2007;50:523–30.
. Hypertensive pregnancy disorders and subsequent cardiovascular morbidity and type 2 diabetes mellitus in the mother. Hypertension 2009;53: 944–51.
. Hypertensive disorders in pregnancy and preterm delivery and subsequent stroke in Asian women: a retrospective cohort study. Stroke 2011;42:716–21.
. Hypertensive diseases of pregnancy and risk of hypertension and stroke in later life: results from cohort study. BMJ 2003;326:845.
. Hypertension in pregnancy: an emerging risk factor for cardiovascular disease. Nat Clin Pract Nephrol 2007;3:613–22.
. Renal pathology in pre-eclampsia. Baillieres Clin Obstet Gynaecol 1994;8:443–68.
. Microalbuminuria after pregnancy complicated by pre-eclampsia. Nephrol Dial Transplant 1999;14:1129–32.
. Kidney disease after preeclampsia: a systematic review and meta-analysis. Am J Kidney Dis 2010;55:1026–39.
. Short-and long-term prognosis of blood pressure and kidney disease in women with a past history of preeclampsia. Clin Exp Nephrol 2008;12:102–9.
. Placental origins of preeclampsia: challenging the current hypothesis. Hypertension 2008;51:970–5.
. Pregnancy and the kidney. J Am Soc Nephrol 2009;20:14–22.
. Neutralization of circulating vascular endothelial growth factor (VEGF) by anti-VEGF antibodies and soluble VEGF receptor 1 (sFlt-1) induces proteinuria. J Biol Chem 2003;278:12605–8.
. Preeclampsia — a glimpse into the future? N Engl J Med 2008;359:858–60.
. Blood pressure and renal function seven years after pregnancy complicated by hypertension. Br J Obstet Gynaecol 1995;102:876–81.
. Low-grade albuminuria and incidence of cardiovascular disease events in nonhypertensive and nondiabetic individuals: the Framingham Heart Study. Circulation 2005;112:969–75.
. Combining GFR and albuminuria to classify CKD improves prediction of ESRD. J Am Soc Nephrol 2009;20:1069–77.
. Adverse perinatal outcome and later kidney biopsy in the mother. J Am Soc Nephrol 2006; 17:837–45.
. Excerpts from the US Renal Data System 2009 Annual Data Report. Am J Kidney Dis. 2010; 55(1 Suppl 1):S1–420, A6–7.
. The health benefits of smoking cessation for adult smokers and for pregnant women in Taiwan. Tob Control 2005;14(Suppl 1):i56–61.
. The role of Taiwan’s National Health Insurance program in influencing adequate prenatal care. Int J Health Plann Manage 2004;19:113–30.
. Validation of the National Health Insurance Research Database with ischemic stroke cases in Taiwan. Pharmacoepidemiol Drug Saf 2011;20:236–42.
. Accuracy of diabetes diagnosis in health insurance claims data in Taiwan. J Formos Med Assoc 2005;104:157–63.